The hundred-year-old images below shows how “Road Meets” were held monthly for the owners of the few private automobiles in Linden and adjoining parts of Cass County during the administration of President Woodrow Wilson. The owners of these early automobiles were eager to show off and make sport in their open cabs and dusters. Note the condition of the roads at this time – graded clay. City streets in County towns were not paved for another two decades. 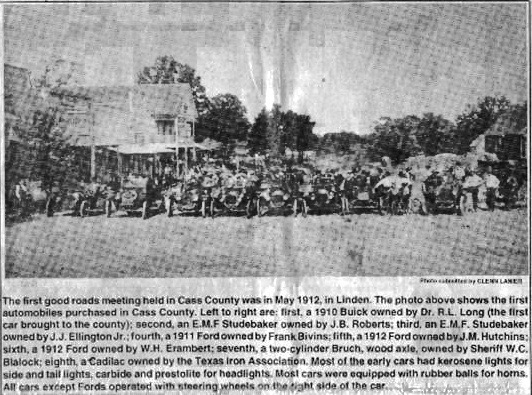 Caption for the photo below: The first good roads meeting held in Cass County was in May 1912, in Linden. The photo above shows the first automobiles purchased in Cass County. Left to right are: first, a 1910 Buick owned by Dr. R. L. Long (the first car bought to the county); second, an E.M.F. Studebaker owned by J. B. Roberts; third, an E.M.F. Studebaker owned by J. J. Ellington Jr.; fourth, a 1911 Ford owned by Frank Bivins; fifth, a 1912 Ford owned by J. M. Hutchins; sixth, a 1912 Ford owned by W. H. Erambert; seventh, a two-cylinder Bruch, wood axle, owned by Sheriff W. C. Blalock; eight, a Cadillac owned by The Texas Iron Association. Most of the early cars had kerosene lights for side and tail lights, carbide and prestolite for headlights. Most cars were equipped with rubber balls for horns. All cars except Fords operated with steering wheels on the right side of the car. This 1912 photo was taken from the middle of Houston Street; the mostly wooden commercial buildings, left, are the east half of the block facing the Courthouse North Portico at that time. 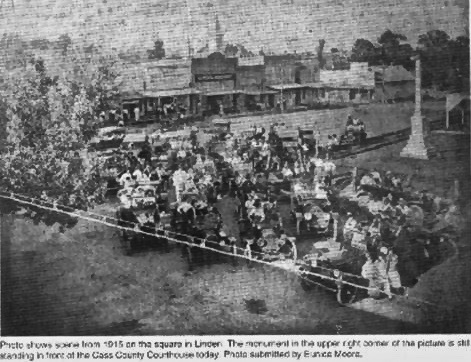 Caption for the photo below: Photo shows scene from 1915 on the square in Linden. 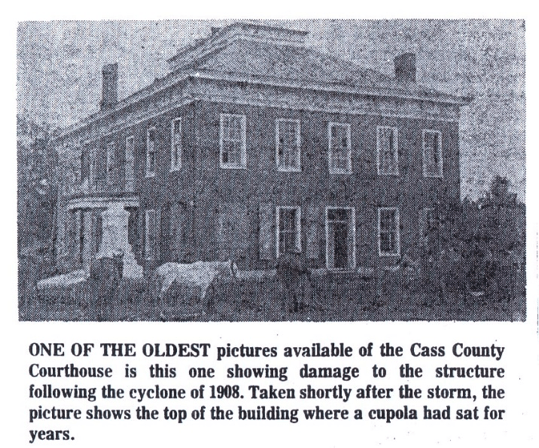 The monument in the upper right corner of the photo is still standing in front of the Cass County Courthouse today. Photo submitted by Eunice Moore. This 1915 image shows a full block of Linden’s commercial buildings as they were at the time along Houston Street, directly across from the Courthouse North Portico. 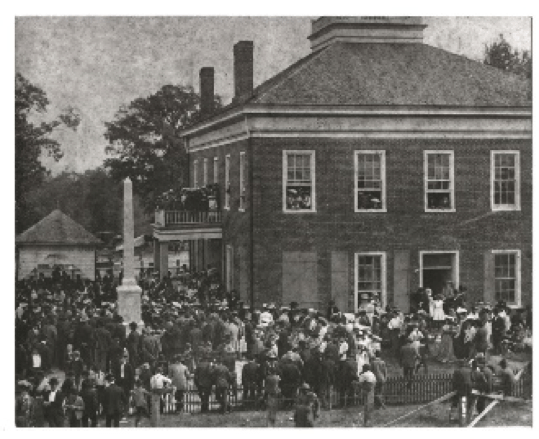 At far right is the Monument to the Confederate Dead and still farther to the right is a glimpse of the public well house in front of the Courthouse north entrance. This well served people, horses, and various other uses for town merchants. The Confederate obelisk, erected in 1903, was toppled in 1908 and then toppled again in a c.1940 windstorm – the second time being 25 years after this 1915 photo was taken. After each of these great storms, the twice-broken obelisk was reclaimed and remounted, which is why its original monument height is significantly reduced. Citty (sic) Council of Linden Cass County Texas met in regular session Sept 1, 1913 and called to order by Mayer (sic) Fant. An ordinance regulating the speed limit of automobiles or moster (sic) vehicles within the corporate limits of the Citty (sic) of Linden Texas. Bee (sic) it ordained by the Citty Council of the Citty of Linden Texas in regular session convened, that the following rules and regulations are hereby established for the regulation of automobiles and other motor vehicles within the corporate limits of the Citty of Linden Texas governing the owners, operators, drivers or persons in charge of automobiles or other motor vehicles. Sec. 1. It shall be unlawful for any automobile or other motor vehicle to be operated on any streets or public road within the corporate limits of the Citty of Linden Texas at a greater speed limit than eight miles per hour, within the corporate limits of said Citty of Linden Texas. Provided further that no person in charge of an automobile or other motor vehicle within the corporate limits shall drive the same at any speed greater than is reasonable and proper, having regard to the traffic or way of others, so as to indanger (sic) the life or property of any person driving or operrating (sic) an automobile or other motor vehicles. Shall at the request or signal by putting up the hand or any other visible signal from any person riding or driving a horse or horses, or other domestic animal cause such a vehicle or machine to come to stand still as quickly as possible and to remain stationary long enough to allow such animal to pass. The text and images in this article were prepared by Sue Morris Lazara. Transcription of the Old City Record Book was done in fall of 2015 by four of Linden Heritage Foundation’s Research Volunteers – Gail Dorgan, Kay Stephens, Catherine Knapp, and Sue Lazara. Next > Save the Date: It’s Time for a Clean-Up at Old Linden Firehouse on Saturday, Nov 5th! told many interesting stories about the people, Courthouse and events in Linden. And, as in my experience, if you exceeded those posted limits, Mr. Macmillan would catch you, give you a warning and tell your parents. I am stunned at the quality of the research and the history this article contains of Linden. Thank you all who participated in publishing it for posterity. The Linden Heritage Foundation website continues to provide a “window into our past” many of us have never seen nor heard of.